Cerevo Inc., an Internet connected consumer electronics manufacturer based in Tokyo, Japan, announces that the final production run of its smart toy DOMINATOR and all the related accessories will happen in Spring 2019. DOMINATOR availability and sales at the Cerevo Official Store will also end when the final production run stock sells out. DOMINATOR was created under the supervision of Production I.G director Naoyoshi Shiotani and Nitroplus designer Makoto Ishiwata. DOMINATOR features characteristics identical to the devices seen in PSYCHO-PASS such as automatic transformation, voiceover and sound effects, authentic LED lighting, touch sensor activation, Crime Coefficient analysis and more. DOMINATOR can also be connected to the Official Companion App to enable connected features. 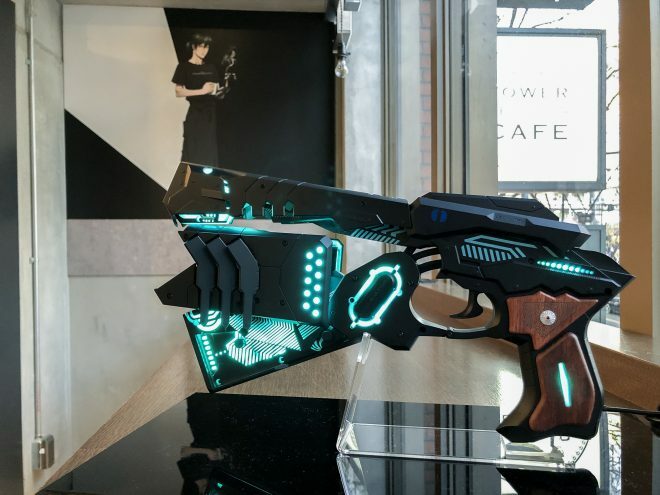 DOMINATOR was released for sale in February 2016 and has been purchased all over the world including Japan, US, Europe and Asia, proving popular with many fans of the hit anime PSYCHO-PASS. After the end of sale of DOMINATOR, we are planning to rent out products in collaboration with a rental service*7. Cerevo will continue to make efforts to encourage fans of the anime PSYCHO-PASS to enjoy Cerevo products. Details of the rental service will be announced after Spring 2019. *1 With the end of production and sale of DOMINATOR, handling of “CTP-DM01A / CTP-DM01A-SP extended warranty service” will end on Thursday, April 25, 2019. *2 For details of DOMINATOR stock at other retailers, please contact each dealer/retailer. *3 Orders for the DOMINATOR main unit are limited to being ordered as a set, which consists of the DOMINATOR main unit, Protector Case, and Display Stand. You cannot purchase the DOMINATOR main unit alone. Protector Cases and Display Stands are available to purchase individually. *4 Even those who have purchased before can place an order. New orders are limited to one set per person. *5 There is no change in the standard warranty period and support service due to the end of production. However, please note that secondary purchase by third parties may not be covered by product warranty or support. *6 Before the order start date and time the product will not be displayed on the web page, or it will be listed but unavailable order. *7 The rental service is planned only for Japan. Cerevo Inc. was founded in 2008 and is located in Tokyo, Japan with a branch office in Redmond, WA, USA. Cerevo is a small batch company focusing on making unique networked devices and connected solutions for both consumer and professional users based on its “Global Niche” concept. Cerevo’s products have been recognized globally and are sold in more than 80 countries and regions. Cerevo Inc., an Internet connected consumer electronics manufacturer based in Tokyo, Japan, announces that it will end the provision of services for the smart microphone “Listnr” at 23:59 on 15th March 2019 (JST). 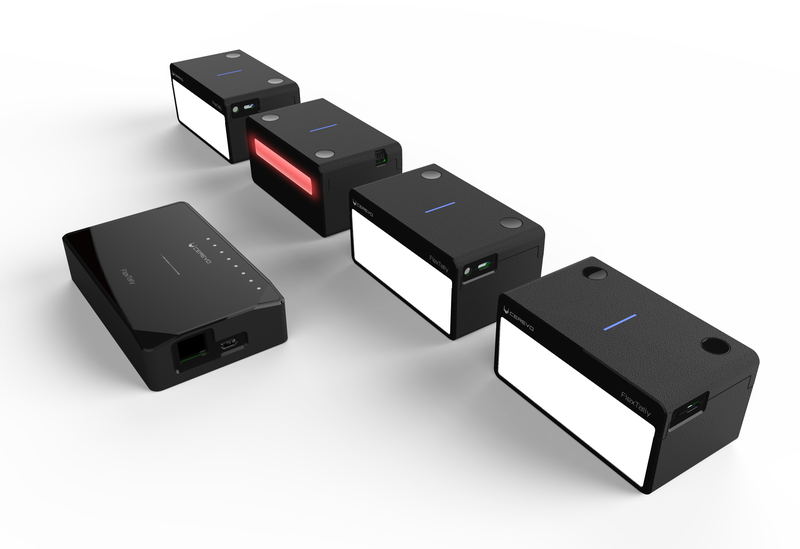 Listnr is a compact IoT device that was launched in January 2016 and was developed based on the concept of “emotions become colors.” Equipped with wireless LAN connectivity and a microphone, Listnr collects sounds and uploads them to the cloud for analysis in real time on a dedicated server. In addition, Listnr can detect emotions from infant voices by using the sound recognition engine “xauris” which was developed based on technology provided by Panasonic Corporation. As a result of last year’s sales discontinuation and low levels of Listnr usage activity, Cerevo will stop the connection function with “xauris” today, and all Listnr related services will stop on Friday, March 15 at 23:59 (JST). We apologize for any inconvenience caused by this termination of service and thank everyone who has used Listnr. We appreciate your patronage and will continue considering the development of home appliances that enrich our lives. For any questions about Listnr, please contact us via email below. *Our support center is located in Japan, so replies will be sent during Japanese business hours (Japanese timezone is UTC+9). *Our support center is closed on Japanese holidays. *We currently do not offer phone support. Cerevo is aware of an issue with one function of the smart alarm “cloudiss”. In the process of linking cloudiss and Google Calendar, an error message appears on the setting confirmation screen (final stage of the process) and can not complete. Currently, we are investigating fixes and are aiming for a swift resolution of the issue. We are sorry to all cloudiss users for this trouble. We will inform you on this web page and the official Cerevo Facebook and Twitter accounts as soon as the issue has been resolved. For your reference, you can still use basic functions such as alarms that specify the time and day of the week using the companion smartphone application and alarm tone/volume changes, etc. without problems. 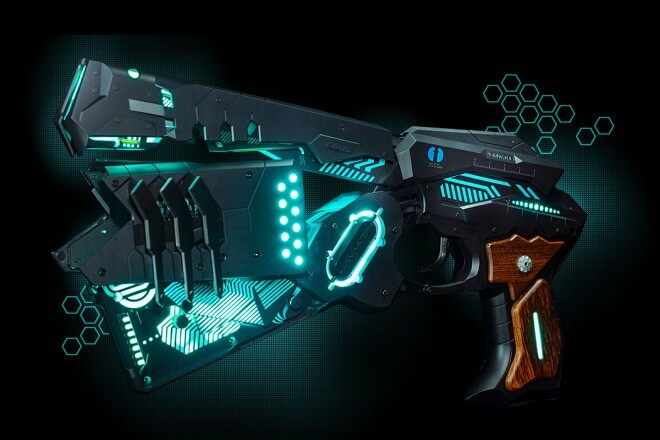 Cerevo will be displaying its best selling officially licensed smart toy, DOMINATOR, a fully mechanized, transforming replica of the gun used in the hit anime “PSYCHO-PASS” (©PSYCHO-PASS Committee). In commemoration of the release of the “PSYCHO-PASS Sinners of the System” theater animation trilogy screening, Tower Records Inc. will open a collaboration cafe called “GINO THE CAFE” at its TOWER RECORDS CAFE (Omote-Sando Shop) for a limited period from 24th Jan through 3rd March 2019. © PSYCHO-PASS Committee © Cerevo Inc.
※DOMINATOR is a display only. In the cafe, customers can not experience or purchase DOMINATOR. The product is available at the Cerevo Official Store. Cerevo Inc., an Internet connected consumer electronics manufacturer based in Tokyo, Japan, announces that it has developed a ski-specific module “SKI-1”, equipped with built-in sensors and data communication functions. 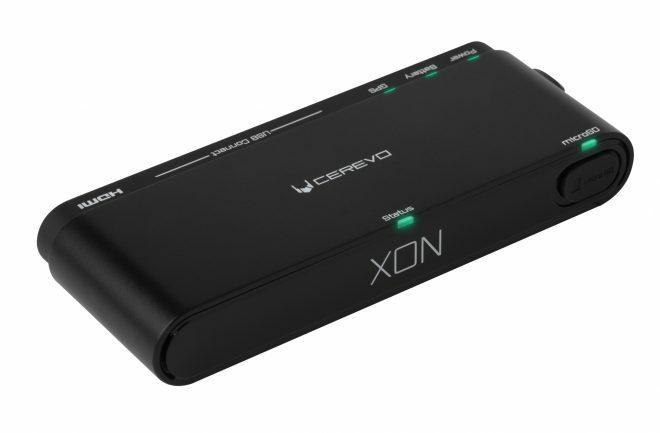 SKI-1, the sixth product of Cerevo’s XON smart sports brand, is also connectable to smartphones for linking to the cloud. Cerevo is collaborating with the first Japanese luxury ski brand Reine Deer, which sells luxury ski-related items such as wooden skis incorporating traditional Japanese craftsmanship produced by Snow Snow Co., Ltd. (Headquarters: Iida City, Nagano Prefecture, CEO: Mika Takagi), by providing them with SKI-1 as a sensor module. Cerevo will exhibit SKI-1 and Reine Deer skis at its own booth at CES 2019 to be held from January 8th 2019. The product is scheduled for release next winter. SKI-1 is a sensor module for skis equipped with an LTE module and multiple sensors. The sensor data is measured by SKI-1 and recorded via your smartphone to the cloud, using the same system which debuted in the first XON series product SNOW-1. Users can check their performance data in real time with the companion smartphone application, by graphically visualizing their skiing they can look back on their own runs and improve techniques. In addition, since SKI-1 is equipped with a GPS and LTE module, if your skis are lost, the location information of the skis is periodically transmitted by SKI-1 allowing you to easily locate them. Cerevo launched the first product in XON series, SNOW-1, in 2015 and selected skiing as a new winter sport to develop the next XON series product for. The reason for choosing skiing was that Cerevo felt the market requirements matched the those of the original SNOW-1. SNOW-1’s function to measure in real time objective information such as the center of gravity, load and bend etc., and to visualize this information to combine with video shot in real time are features that both amatuer and professional skiers also desire. As a result of consulting with Snow Snow, a manufacturer of winter sports equipment, we felt that we could use the leading technology from SNOW-1 for skis. We then began model development collaboration with Reine Deer to respond to user needs to improve skiing skills using IoT. The ski on the right features Fujin, the god of wind and Raijin, the god of thunder in gold leaf, the lion’s design on the left uses the techniques of Makie, Mother-of-pearl, and Japanese Lacquer. “When the 2011 Great East Japan Earthquake occurred, I learned the shocking news from overseas and tried to find something that I could do for the affected area, during that time I learned about the excellent traditional crafts in the Tohoku region. Currently, I am developing skis and ski wear using traditional crafts and I am convinced that sports with common rules around the world such as skiing are a key to overcoming cultural differences. This collaboration between the skis of the ski equipment brand Reine Deer and Cerevo’s SKI-1 makes for a thrilling item that merges traditional Japanese crafting techniques and the latest IoT sensor technology from Japan. It is a product that can be fully enjoyed all over the world, combining technology which visualizes the skill and movement of traditionally crafted skis. At the same time, it is a product that can protect against theft or loss which is a concern, so I am very excited to see this product come to fruition. A selection of high-resolution images can be found at the link below. Cerevo Inc., an Internet connected consumer electronics manufacturer based in Tokyo, Japan, announces a new addition to its XON sports equipment brand. Cerevo has developed a sensor device with streaming function, ZECH-1, that captures driving conditions with multiple integrated sensors, synthesizes visualized data and camera images in real time, and can live stream video in Full HD. Cerevo will exhibit ZECH-1 at CES 2019 to be held from January 8, 2019 in Las Vegas. The release of ZECH-1 is scheduled for the summer of 2019 and will cost 999 US dollars. (tax excluded). This product is can be attached to a four-wheel race vehicle and connected via the vehicle’s OBD-II connector. Unlike other general data loggers that only record traveling data, visualization information is generated by ZECH-1 in real time and can be live streamed directly, allowing team members to analyze a wealth of data while the vehicle is still on the track. Moreover, the data from ZECH-1’s built-in 6-axis sensor and GPS, such as position and speed, acceleration, angular velocity, vehicle condition etc can be instantly live　streamed from ZECH-1. It is also possible to record to a microSD card. All of this data is displayed in a graphical overlay to accompany the race video. Live data can be streamed in real time, using a 4G/ 3G communication network. You can use the data for creating new race strategies (*1) and improve your team’s performance by sharing data such as the position of the race vehicle and current fuel and water temperature to team members in the pit. (*)Please check the regulations of each circuit and race before using ZECH-1. 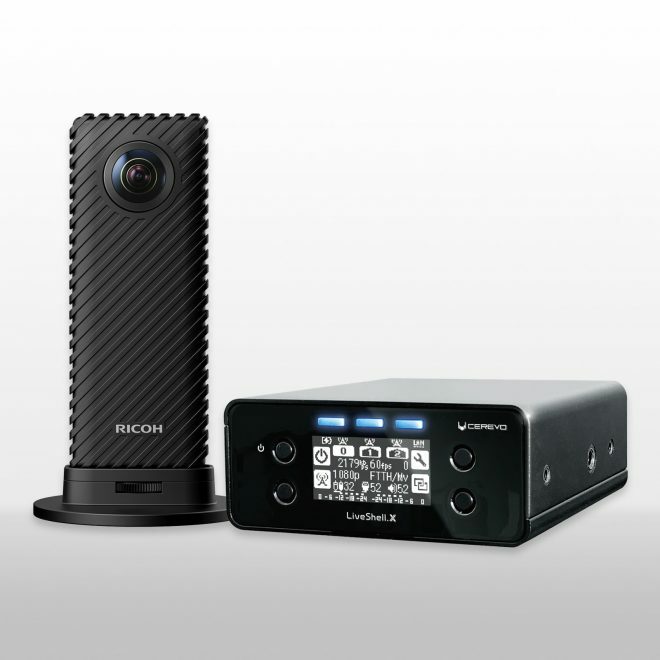 With ZECH-1, it is possible to stream to major live streaming services at a resolution of up to 1080/60p or record to a microSD card. Full streaming control is available using the “Dashboard” control panel provided from Cerevo LiveShell series. devices and connected solutions for both consumer and professional users based on its “Global Niche” concept. Cerevo’s products have been recognized globally and are sold in more than 80 countries. Cerevo Inc., an Internet connected consumer electronics manufacturer based in Tokyo, Japan, will be exhibiting and demonstrating ORBITREC, a connected road bike with advanced internal sensors and a 3D printed frame at CES 2019 to be held from 8th to 12nd January 2019 in Las Vegas. There will be a Touch and Try area where visitors can actually ride the ORBITREC bike and experience its performance, visitors can also check out the companion mobile app at Cerevo’s booth. Cerevo today announces that ORBITREC’s price will be 140,000 US dollars per unit for this fully custom-made bike. By taking precise measurements of your body Cerevo will design the frame to the owner’s exact size and produce it using 3D printer technology, resulting in a bike made exclusively for each owner. The price includes travel and accommodation expenses to Japan to take measurements for your custom frame and also delivery of the bike to you in Japan after completion. We would like to invite you to Japan for this special trip to experience receiving an IoT bike that has been made uniquely for you. 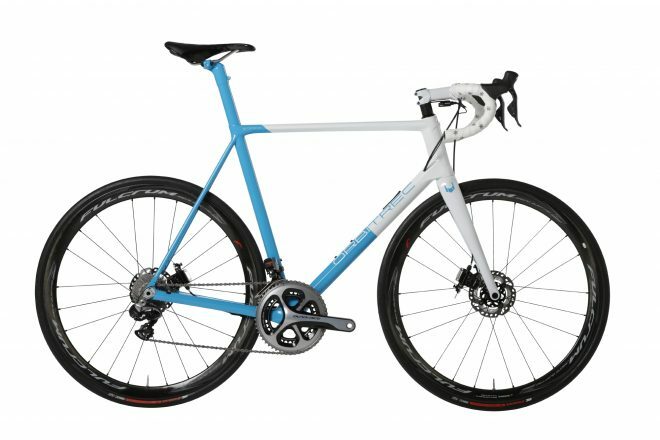 Cerevo believes this is a unique opportunity and perfect for rare bicycle collectors and racing bike enthusiasts. ORBITREC was produced by Triple Bottom Line (designer Satoshi Yanagisawa’s design unit) DMM.make AKIBA and ABBALab. Originally developed from the concept model DFM01, ORBITREC was born from this collaboration. To enable a customized frame to perfectly fit each individual owner, a 3D printing process combining sintered titanium and carbon fiber tubes has been developed. The customized lightweight frame can be used for personal or professional riding. Various sensors are built into the bike’s frame, which can receive and send information, creating a ride log while cycling. 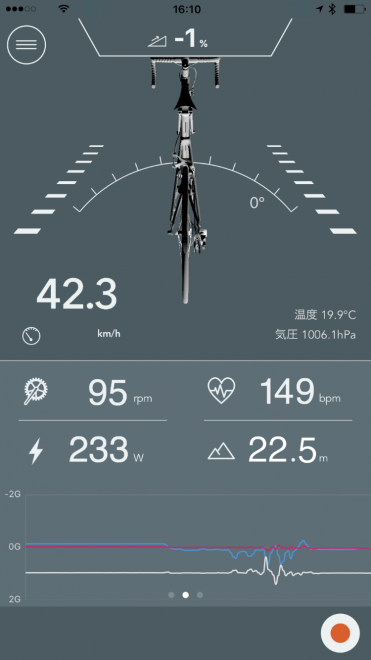 The big data obtained by ORBITREC and RIDE-1, Cerevo’s smart riding recorder, is then analyzed in the cloud to further help and record your riding. You can also connect to ORBITREC through its companion smartphone application. ORBITREC features a 9 axis sensor (acceleration, angular velocity, geomagnetism), temperature, atmosphere and illuminance sensors as well as GPS. In addition to basic information such as riding location and velocity, frame status such as lean and impact can be recorded. When combined with the GPS sensor this creates a detailed riding log history that can easily be viewed at any time. Users can also make the most of the data of other ANT+ compatible sensors by connecting smartphones via Bluetooth. This product has been made using 3D printing technology and uses 3D printed sintered titanium　joints. As a result, it was possible to mass produce parts with sufficient practical strength using a　3D printer. existing road or cyclocross bike user can experience similar functions to ORBITREC. Cerevo Inc., an Internet connected consumer electronics manufacturer based in Tokyo, Japan,, will be exhibiting at CES 2019 and demonstrating some of its smart sports brand “XON” products centering two brand-new products to be announced at CES 2019. Also there will be a smart sports product to be disclosed on its delivery while opening for a trial at the booth. 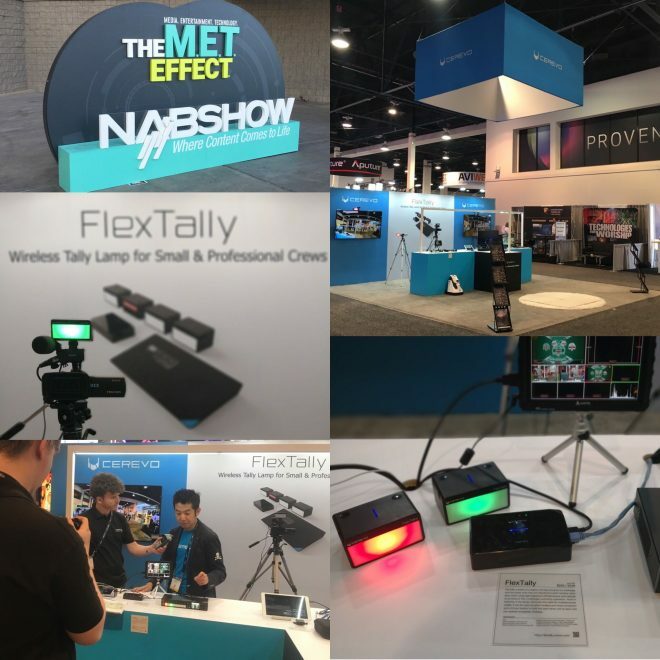 CES is the world’s gathering place for all who thrive on the business of consumer technologies to be held in Las Vegas, the United States from 8th-11th January 2019.